Blackpool manager Lee Clark said the abandonment of their final-day game against Huddersfield "compounds an absolutely horrendous season". 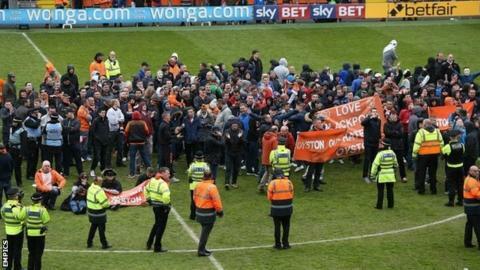 Hundreds of fans ran on the pitch after 48 minutes, angry at the running of the club and relegation to League One. Clark said: "The supporters were just acting on this season and the culmination of the relegation." The Lancashire club confirmed they will watch CCTV coverage of the invasion to see who was involved. Clark added: "I love football and I didn't want to be involved in anything like this. "As soon as it happened I went straight into the dressing room and I didn't go back out. It's a sad, sad day for football." About 2,000 fans took part in a demonstration before the game to protest over the way the club is run by the Oyston family. With the score at 0-0 shortly after half-time, Blackpool supporters made their way onto the pitch and headed towards the centre circle. Some fans released flares and began angrily chanting towards the owners in the directors' area, as tensions rose inside the stadium. One fan joined the protest on a mobility scooter, while others broke out in a conga line as supporters continued to voice their frustrations. Referee Mick Russell wanted to get the game back under way but it was eventually called off on safety grounds after over an hour of on-field protesting. Clark said: "We kept chatting to the referee and the officials and match commander, but we couldn't determine what was going to happen or how long we'd have to wait before it was abandoned and what the sanction would be." Huddersfield boss Chris Powell said: "To be fair to the referee, he was a little bit in shock but handled it well and got advice from safety officers and the head of police. They tried their best to get the game back on but in the end they couldn't guarantee our safety." Terriers chief executive Nigel Clibbens said: "After the protest, when the abandonment came we were ushered into the boardroom and locked in as a precaution as home supporters looked to storm towards the boardroom. This was disconcerting." Some 250 Huddersfield fans cycled 70 miles on Friday from their town to Blackpool for charity and were set to cycle back after Saturday's game. Club chairman Dean Hoyle said they "were faced with a late start in difficult conditions because of the events surrounding today's game". Ian Chisnall was at the game for BBC Radio Lancashire: "This abandonment and huge embarrassment to the club was no accident or spontaneous reaction. There has long been a feeling around Bloomfield Road that a coordinated protest designed to achieve maximum publicity was being planned for the final home game. "The pre-match marches and speeches set the tone but gave no indication of what was to follow. "It was loud but largely peaceful in nature until, after over an hour, the announcement came that there would be no more football. The decision, inevitable and entirely correct, prompted wild celebrations by the 500 or so protesters still on the pitch until things turned dangerously nasty. "A small group managed to scale a couple of walls and began to batter the windows in the directors' area. Order was swiftly restored and one of the football club's darkest days fizzled out in the pouring rain." Why are the Tangerines fans so angry? Blackpool, who were in the Premier League in 2010-11, were the first professional English team to be relegated this season, back in early April. They have declined badly since their one season in the top flight, when they were much admired for their attacking football under Ian Holloway. The Tangerines turned over more than £100m since their promotion. Three seasons later and they had just six first-team players when Jose Riga arrived as manager in early pre-season. Only eight professionals were under contract two weeks before their first Championship game at Nottingham Forest. Despite signing 12 players in 12 days, they only had nine men eligible on the morning of the game and eventually named a four-man bench. Owner Owen Oyston and chairman Karl Oyston sued three fans for comments made on the internet, with football fans from around the UK raising the £20,000 needed by one of them for his damages bill. The chairman is being investigated by the FA for allegedly breaching five FA rules by sending abusive and insulting words to a Blackpool supporter. A statue of legendary ex-player Stan Mortensen - where fans reportedly planned to protest this weekend - has disappeared. A spokesman for the Tangerine Knights and Blackpool Supporters' Trust, which organised the pre-match protest, said: "Karl Oyston said 'judge me at the end of the season'. Now it is judgement day and it is time to let the Oystons and the nation know that we have reached a unanimous verdict - guilty." Clark, who replaced Riga as boss in October, said: "I have the feelings of a supporter and I'll never criticise them. "Since I came through the door there has been a very toxic atmosphere and you can't be successful with that." It is not known if the match will be replayed at a later date. Neither Blackpool, already relegated, nor 16th-placed Huddersfield have anything to play for. A Football League spokesman said: "It will be for the Football Association to consider any matters relating to crowd behaviour, with the Football League ruling on whether or not the match should be replayed." Clark said: "Is the game going to be replayed? No-one knows as it's a unique situation." Huddersfield boss Powell revealed his players are going on their holidays on Tuesday. "What happened is something that I've never seen before. It's unprecedented and what's going to happen now? "It's strange to end the season this way. There's talk of replaying it but half my team go away on Tuesday, so I really don't know what is going to happen. I don't know how they are going to do it." Blackpool released a statement saying: "The club would like to confirm that all available CCTV footage is now being collated and studied by the relevant authorities to identify those who took part in the pitch invasion and other offences of disorder. "The club will work with the relevant authorities to take appropriate action against all those responsible for disorder offences inside the stadium. The club will also co-operate fully with The Football Association and The Football League in light of any investigations that follow on from the match being abandoned. "The club would like to offer its sincere apologies to Huddersfield Town Football Club, its supporters, manager, players and directors, as well as the Blackpool supporters who remained in the stands." Huddersfield chief Clibbens said: "Today's events stopped us potentially finishing in a higher league position - all through no fault of our own. That is not right. "We were in contact with the Football League during the game and, at the end, I spoke personally with Football League chief executive Shaun Harvey and gave our initial observations on the events. "It would be easy to dismiss the impact of the abandonment because it doesn't affect relegation and promotion, but in my memory it's unprecedented for a fan protest to lead to the abandonment of a game - and the implications in the longer term need to be seriously considered."